Here’s the thing. I’m a decent person. Make an honest living, pay my taxes, treat my kids nice when they come for the weekend. I’m no angel, sure. I like a beer at the end of the day same as the next guy, maybe there’s a folder on my home computer that I make sure to hide when the kids are visiting, but I’m a man, right? 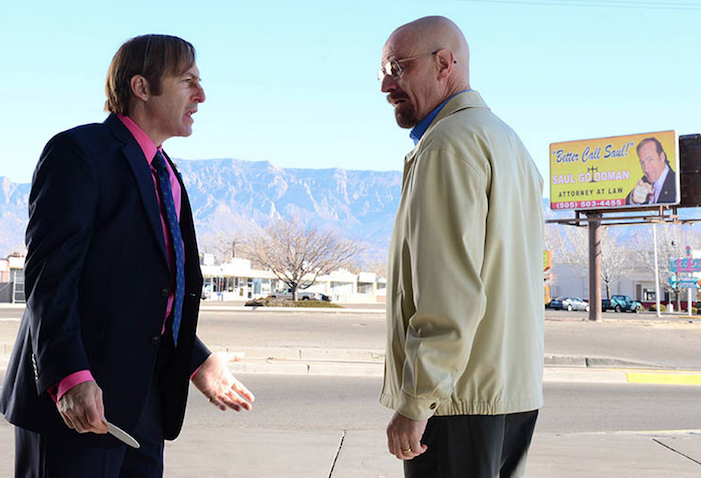 So lemme ask you — what do I have to do to get my G-D eyes on a trailer for AMC’s “Better Call Saul”? I’m not normally the type to get too excited about a TV show like “Breaking Bad,” especially one that treats drug dealers like heroes. Didn’t serve my country in Operation Desert Storm for four years for that sort of thing to become okay. But my son Sammy, he might be a little young at 14 to be watching that sort of thing, but he got me hooked. And y’know, managing Richmond’s third-largest self-storage facility isn’t as busy a job as, say, managing Richmond’s second-largest self-storage facility. Plus, I’m the boss, which means if I wanna watch an episode or two during my lunch break, who’s to say I’m wrong? And maybe then I watched some at nights. With my beer. But all that ended last year when the show did. I tried watching “Walking Dead” and “Mad Men,” but everyone just seemed so sad. Not that “Breaking Bad” wasn’t sad, but it was funny sometimes. And I dunno. I guess I just got where Walter was coming from, y’know? Anyway, I’ve been waiting for months now to see something, anything, about “Better Call Saul” and what kinda show it’s gonna be. They had those clips up on the Internet last month, I know, but they didn’t really show you anything. I think they were literally the same scene, just with a bunch of extra talking by that guy with the mustache. I guess it’s cool to hear from the guys behind the scenes, but it just reminds me of how when I moved out, Karen promised that she’d discuss me coming back in a few months. And that was over a year ago. It only happened the one time. But Karen just won’t listen. Will 2003 be a good year for Saul? I don’t know! Because all this video is is a bunch of the guys who make the show telling us how great it is to make the show! Who cares? I wanna see Saul show off that legal know-how! I wanna see Mike get mad and shoot people! I wanna see the show, damn it! But all AMC seems ready to tell us is that everyone who makes “Better Call Saul” likes each other a lot. That they’re a family. Anyways, I’m still pretty excited for next year — gives me something to look forward to during the holidays. Christmas dinner at my sister’s place just isn’t the same, you know? But please, AMC, next time you put up a video, make it a for-real trailer? Please, AMC. Help a fella out. Rob T. Jenkins lives in Richmond, Virginia and is definitely a real person. “Better Call Saul” premieres February 2015 on AMC.